My thermometer will have RGB leds beneath every nixie tube, to be able to light them up with different colors. Within the led package, there’s a WS2812 (datasheet) control chip, which offers 16M of colors, 256 levels of brightness and a minimum refresh rate of 400Hz. 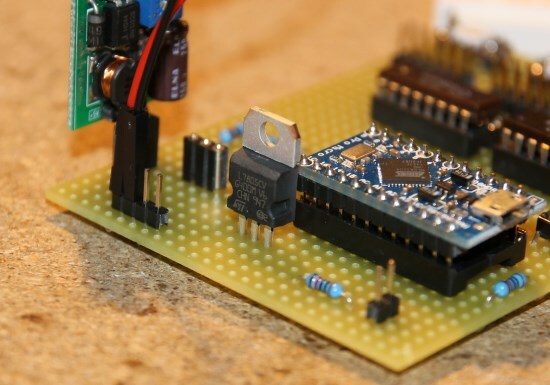 You can control those WS2812 drivers using a simple serial protocol: the different leds are chained (DOUT -> DIN) and the first one is connected to a digital PIN of your Arduino, the different commands are sent through. The first parameter identifies the PIN of your Arduino the leds are connected to and the second one the number of leds. the first parameter identifies the led your sending the command to (0 is the nearest to Arduino) and the next three ones are the values for each primary color.